Egyptian President Mohammed Morsi: "Jihad Is Our Path & Death in the Name of Allah Is Our Goal"
Mohammed Morsi won the Egyptian presidential election today. He campaigned on jihad and death in the name of Allah. Egypt’s Constitution should be based on the Koran and Sharia law, presidential candidate from the Muslim Brotherhood Islamist movement Mohamed Morsi said. “The Koran is our constitution, the Prophet is our leader, jihad is our path and death in the name of Allah is our goal,” Morsi said in his election speech before Cairo University students on Saturday night. Today Egypt is close as never before to the triumph of Islam at all the state levels, he said. “Today we can establish Sharia law because our nation will acquire well-being only with Islam and Sharia. The Muslim Brothers and the Freedom and Justice Party will be the conductors of these goals,” he said. The Muslim Brotherhood Islamist group has been banned in Egypt for decades before being legalized following the ouster of President Hosni Mubarak in last year’s popular uprising, and has since emerged as a powerful political force. Today Morsi won the presidential elections in Egypt. 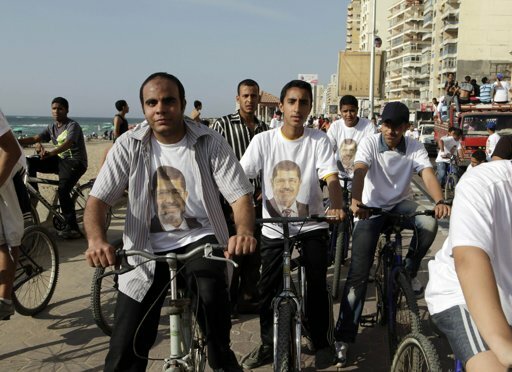 Egyptian secular party leaders blasted the Obama administration’s support for the Muslim Brotherhood.